< How to make a Dragon puppet and Goat for Chinese New Year with Bostik! Make a unique Valentine’s Card with Bostik! It’s half term week here in Derbyshire and the kids have been here, there and everywhere! It might have been easy to forget Valentine’s Day but we’ve managed (just!) to fit it in. But who wants to make a boring old Valentine card? Certainly not us! So this Valentine’s don’t just give your loved one any old shop bought gift, give them a masterpiece of classical art (in card form). Make a unique Valentine’s card depicting the birth of Venus! How better to say I love you than with the Goddess of love herself. The idea is all my own and I’m very pleased with it. However all the products used in this card creation were provided by the lovely folks at Bostik as I’m a Bostik Craft Ambassador in association with the Tots100. I’ve made a little video to show you just how the card is made, but if you’d prefer text instructions then take a look below. Step 1 – Start by taking one paper plate and folding it carefully in half. Step 2 – Cut a triangle shape out from each end of the fold in the plate, to give the plate a shell shape. Step 3 – Cut a piece of thin card 10cm X 1 1/2cm. Fold the card in three places: after 1/2cm, 2cm & 7cm. Step 4 – Using some Bostik Micro Dots cut two short lengths to stick onto either end of the strip of thin card. Remove the clear backing to reveal the sticky dots. Step 5 – Stick the card strip onto the back of the plate to make a platform and hinge for your pop-up figure. Step 6 – Draw your pop-up figure, I drew a (naive) version of the Goddess Venus holding a heart. Of course she could look however you’d like. Colour and cut out your figure. Step 7 – Using a long strip of Micro Dots stick the figure to the pop-up hinge on the plate. Step 8 – Cut a strip of thin card 3 1/2cm X 1 1/2cm. Create two folds, the first after 1/2cm, then again after 2cm. Cut some Micro Dots and attach to the smaller 1/2cm fold. Step 9 – Attach a pop-up decoration to the larger 1cm fold, I used stick on foam hearts. Pull off the clear backing from the Micro Dots and attach the decoration to your plate. Make as many as you like! Step 10 – In the original painting a Cherub flies in the air above Venus, I used a Cherub shaped hole puncher with sticky back plastic to create my own versions. I added glitter using Bostik Glitter Pens and jewels and hearts using Bostik Glu Dots. Ta-Da one gorgeous and very unique Valentine’s card! If you do decide to make your own plate masterpiece then please do send me an email and tag me in the post, I’d love to see how they turn out! 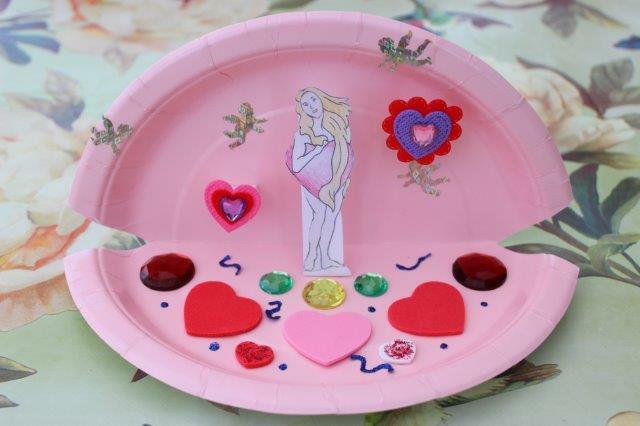 This entry was posted in Tutorials and tagged birth of Venus, bostik, card, chidlren, craft, greeting card, kids, make, tutorial, valentines, Venus. Bookmark the permalink.